I left this piece unfinished to speak of the struggles I face with trying to learn to live with Rheumatoid Arthritis and with trying to continue making art. RA has affected my hands so holding a paintbrush has become difficult so I've started painting with my fingers. I've used this as a way to incorporate my experience with this disease into my work. My technique is not the only thing I use. 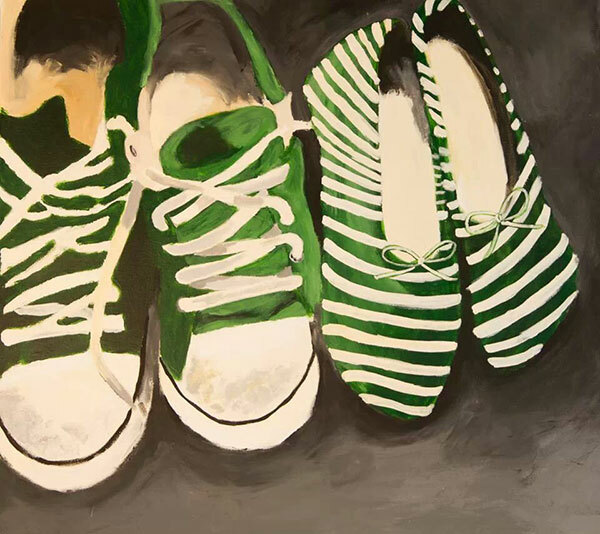 The shoes represent the idea that you can't tell what a person is going through unless you walk in their shoes. I may look healthy on the outside but if you were to look inside you would see the war that my immune system has waged against my body.